Designing your dream bathroom can be tricky. Unfortunately, the location of your water pipes means that there are some limitations on what you can do. This issue is compounded when you’re working with a small space. However, we don’t want you to lose hope! There are many ways that you can decorate a small bathroom space to make it look bigger and more appealing. One of the biggest mistakes homeowners make is painting a small room with a dark color. Visually, this creates a “closed-in” effect, and the room appears much smaller as a result. Instead, opt for opening up your bathroom by choosing a lighter color for your walls, and then pairing it with darker flooring. Light walls reflect light better, making the room appear much larger. As we mentioned, light walls will make your bathroom appear larger. However, if your overall color scheme is too neutral, the space will lack visual interest. 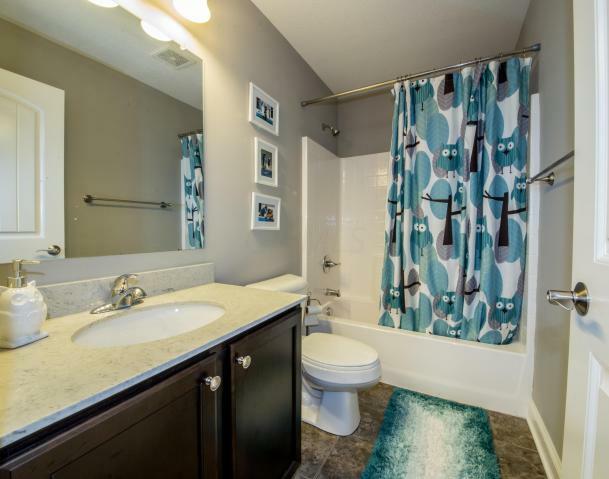 To liven it up, strategically add pops of color by selecting vibrant towels or colorful bathroom accessories. These little touches will make your bathroom look more home than hotel. When you don’t have a lot of floor space, vertical shelving is a smart move. Invest in shelving or a cabinet that can be installed above the toilet. This will make your bathroom look less cluttered while providing you with ample space to store personal items you want kept out of sight. A shower curtain can make a room appear much smaller. Instead, consider a glass shower door. It may be more costly up front—but it will give the illusion of more space, because it allows you to see the entire bathroom rather than just a portion of it. As a bonus, glass shower doors are easier to clean and longer lasting than shower curtains. If you have a bathroom that’s rarely used for indulgent soaks, then you might want to eliminate your bathtub altogether. Installing only a shower will free up significant space, making your bathroom appear much larger. Save those sudsy bubble baths for the master bathroom instead! A well-placed mirror reflects light, giving the illusion of a larger room. Opt for a mirror along a narrow wall or above a vanity. A mirror will not only make your room seem bigger, but it will also add a touch of elegance to your design. If you’d like help designing or building your perfect bathroom, you’ve come to the right place! As a home builder, we can help you to create a comfortable, beautiful bathroom that reflects the overall design aesthetic of your home. To set up a consultation or get more information about Regent Homes, simply click here or contact us today at 614.529.2927. We’d love to help you design your dream home!